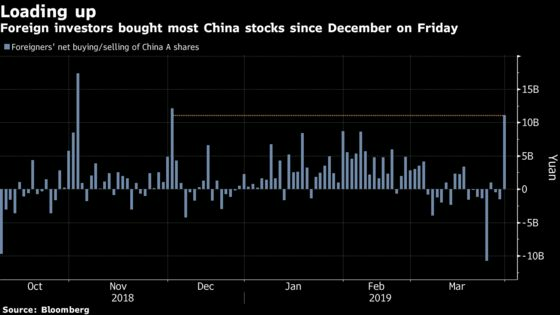 (Bloomberg) -- Foreign investors are rekindling their interest in Chinese shares just days after selling the most on record, with fresh encouragement from strong corporate earnings and a rally rounding out the best quarter since 2014. They net bought 11.1 billion yuan ($1.7 billion) of mainland-listed equities via exchange links with Hong Kong on Friday, data compiled by Bloomberg show. That’s the biggest single-day purchase since Dec. 3 and turned the tables on a month that was heading for net outflows: in the end there were 4.4 billion yuan of inflows in March. The Shanghai Composite Index jumped 3.2 percent Friday, taking its world-beating rally this year to 24 percent, amid better-than-expected results from companies including Kweichow Moutai Co. The liquor giant, a favorite of overseas investors, rose 5.9 percent, its biggest gain since Dec. 3 also. Offshore investors have been net buyers of China’s A shares in all but two months since a second exchange link with Hong Kong opened in late 2016. They net bought a record average 4 billion yuan of A shares per day in February, before MSCI Inc. decided to boost the weight of Chinese stocks in its universe. Buying slowed in March as the Shanghai gauge zigzagged in a narrow range, testing investor confidence ahead of Friday’s final spurt.